Dan Garrett is the magic ingredient to add a touch of magic to your next event! Dan Garrett creates custom presentations for your group. Dan was the only magician from the state of Georgia invited to perform at the Presidential Inaugural Candlelight Dinner, January, 2001, in Washington, D.C.
Dan Garrett is the first and only three-time winner of the Greater Atlanta Magician of the Year trophy! 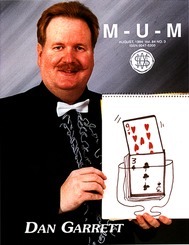 Dan Garrett served as National President (1994-95) of the Society of American Magicians, the world’s oldest and most prestigious magic society. This is the same office held by the legendary magician Harry Houdini. Dan has been featured on the cover of their professional magic magazine multiple times. Rated one of the top magicians in the United States, Dan Garrett has had many live television appearances, including a feature performance on CNN Headline News (seen live by hundreds of thousands of viewers around the world)! Dan Garrett was the Vice-President for Georgia, USA, of the International Brotherhood of Magicians. He was on the cover and a feature story in their international magazine The Linking Ring. Dan was chosen by the public as “Best of Atlanta” for six consecutive years, as published in the book Best of Atlanta. Dan Garrett has an international reputation in magic for outstanding performances across the USA and in over a dozen other countries. IBM, AT&T, SONY Corporation, HBO, Inc., BellSouth, Delta Airlines, CitiBank, United Van Lines, Hayes Microcomputers, Panasonic, Amoco Oil Co., American Airlines, Pittsburgh Corning, Young Presidents Organization (YPO), Boy Scouts of America, TeleSuite Corporation (videoconferencing) and many more.